Mondorf Parc Hotel is situated in a green area and offers rooms with free access to Mondorf Spa. It features a 1800 m2 fitness centre and large gardens, as well as free WiFi in all areas. The hotel offers comfortable rooms in its 4-star property, each with their own balcony. Guests can make free use of the thermal pool, saunas, steam baths and spa baths at Mondorf Spa. There is also 1800 m2 fitness centre, a tennis court and an outdoor pool. The restaurant specialises in dietary meals and quality wines. The Bistro offers a snack menu and there is a terrace for warm weather. With a 4-star hotel in a garden and decorated with bright colors, Casino 2000 is in the countryside, 19 miles from Luxembourg City. Free Wi-Fi and a 24-hour front desk are provided. Decorated in neutral colors, the modern rooms provide air conditioning, a flat-screen satellite TV and minibar. Each has a private bathroom with a bathtub and shower. Restaurant Purple Lounge is American-themed, while Restaurant Le Manège provides a range of buffet dishes. Fine dining Restaurant Les Roses has been awarded a star by the Michelin guide. Room service is available and there is a bar on site. Mondorf-les-Bains Thermal Spa and a golf course are both within a 3 minute drive. There is a vineyard 2 miles away and some Moselle Valley vineyards in Germany are around one hour by car. Situated half a mile from the French border, Casino 2000 is also half a mile from Highway A13. On-site parking is free. 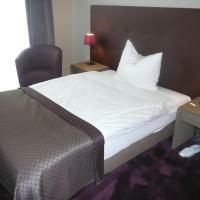 Our hotel is located in the center of Mondorf-les-Bains, close to the Domaine Thermale and Casino 2OOO. Our suites of 375 ft² are equipped with all the modern comforts. Whether for a culinary stay, business, pleasure or spa treatment, the Hotel Windsor and its restaurant 'Entre Nous' welcome you with some exceptional room-restaurant packages guaranteeing a successful stay. Am Klouschter is a hotel offering spiritually minded accommodation in a tranquil setting less than a 10-minute walk from Mondorf-les-Bains. It features wellness facilities, a beauty salon and free WiFi. Each of the rooms at Hotel Am Klouschter features modern décor and a TV. They also have private bathroom facilities. A buffet breakfast is served daily in dining room. Luxembourg city centre, featuring the Place d'Armes and the Palais Grand-Ducal, is 25 minutes’ drive away. The French border is 1 km away and Saar-Hunsrück Natural Park is less than 15 minutes by car. Luxembourg Airport is 35 km away. Guests benefit from free access to the fitness centre and the wellness area with a spa bath and a sauna. Guests can dine at one of the many restaurants in the surrounding area. Villa Welcome is set amidst large gardens in Mondorf and offers rooms with free access to Mondorf Spa, which features saunas, steam baths, thermal pools and a 1800 m2 fitness centre. Free WiFi is available in all areas and on-site private parking is possible free of charge. At the Domain Thermal Spa, guests can a wide range of massages and spa treatments upon request, relax in the thermals pools and swim in the indoor and outdoor pools. Tennis courts are also available at Villa Welcome. All of the rooms in the villa feature parquet floors and warm colours. They come equipped with a flat-screen TV with cable channels and a spacious bathroom with a shower. Breakfast consists of coffee and croissants. The next-door De Jangeli offers French specialties. Also available for quick snacks and drinks are Maus Kätti Bistro, Feierwon Cocktail Bar and the Club Lounge. This family-run hotel boasts boutique-style rooms with modern facilities and a gourmet dining restaurant. Beau-Séjour offers free Wi-Fi and is only 350 metres from the Mondorf Les Thermes spa. Each of the rooms at this intimate hotel features a flat-screen cable TV, work desk and refrigerator. Beau-Séjour serves a continental-style buffet breakfast each morning including different kinds of breads, cereals and coffee. Casino 2000 is 600 metres from Beau-Séjour. The key sights of Luxembourg city, including the Palais Grand-Ducal and Place d’Armes, are only 30 minutes away by car. Free private parking is available at the hotel. Guests can enjoy seasonal French cuisine in the elegant dining room at Le Nid Gourmand. The restaurant serves à la carte dishes inside and out on the terrace in warmer weather. Dolce Vita offers free Wi-Fi and a traditional Italian-style restaurant with a spacious terrace in the centre of Mondorf-les-Bains. The thermal baths are only 100 metres away. Each of the bed-and-breakfast rooms at Dolce Vita has flat-screen cable TV and a private bathroom. A buffet breakfast is served daily and includes a selection of breads, eggs and fresh fruits. Fresh pastries are available at the weekend. Casino 2000 is only 200 metres from Dolce Vita. The French border is less than a 10-minute walk from the property. Luxembourg city’s historic centre is 25 minutes’ drive away. Guests can enjoy locally reared meat or pizza from the wood-fired oven. There is also a wine menu offering a wide variety of wines. The English-style pub has a flat-screen TV which shows sports events. Set 300 metres from the Domaine Thermal Baths, Belle Fontaine is set in the quaint village of Mondorf, in the south of Luxembourg. Featuring free Wi-Fi, it has a restaurant and spacious rooms with flat-screen TVs. With light green walls, each room has cable channels, a fridge and desk. The private bathrooms provide a shower, hairdryer and free toiletries. The daily breakfast buffet includes sliced meats, cheese, hard boiled eggs, spreads, bread and cereals as well as orange juice and water. Overlooking the garden, the restaurant features an exposed brick wall and modern art. It serves a variety of Italian, French and Luxembourg cuisine for lunch and dinner. The town’s tourist information office is on the opposite side of the road and Mondorf Casino is 600 metres away. Located right by the French border, Belle Fontaine is 4 km from the A13 motorway and 5 km from Golf Château de Preisch in France.